The Social Network led the Blu-ray sales charts this week, but despite this fairly well received movie, Blu-ray sales actually dropped overall compared to last week, with market share rising slightly. The Social Network outsold pretty much everything this week, including Inception at 2nd place by almost a 4 to 1 margin. Piranha 3D was the next highest ranked new release, at 4th, and that was it in terms of new releases in the top 20. Note that the Piranha 3D figures include both the 2D only and 3D Blu-ray versions of the movie (as otherwise, the results would be quite a spectacular one for the 3D Blu-ray format). This lack of new releases was probably what was responsible for the low overall business. Another week in which Blu-ray market share stayed just under 20%. The Social Network managed 44.95%, which is quite a good result for a biographical drama. Piranha 3D recorded a 46.68% Blu-ray market share. The stats for the week ending 16th January 2010 are as follows (you can see stats and analysis for the week ending 17th January 2010 here - note that data has since been revised, and the reporting period has changed as well, but this historical data is still useful for comparison purposes). Blu-ray sales increased by $5.74m (up 27.02%), while DVD sales decreased by $34.08m (down 23.9%) producing an overall loss of $28.34 million in combined revenue. Blu-ray's market share increased from 12.96% to 19.91% (a growth of 53.63%). There weren't really any A-list releases this week, and as a result, both Blu-ray and DVD sales actually dropped compared to last week. Takers was the week's best selling Blu-ray title, outselling last week's number one, The Social Network by a small margin. The other new releases for the week were Buried in 7th, Justified: Season 1 in 9th and Death Race 2 in 10th. There was only one other new release in the top 20. Stone came in 14th. Blu-ray market share fell compared to recent weeks, but it's still pulling above average at just under 18%. The best selling Blu-ray title of the week, Takers, managed to pull in 32% market share for the Blu-ray version - a fairly average result. Not that the other new releases did any better - Justified: Season 1 managed a lightly higher market share at 32.8% (although this is good for a TV series), and Death Race 2's 22% is fairly poor. One title I haven't mentioned is Buried, which is a very interesting release indeed. It's not just the premise of the movie, someone buried alive inside a coffin with limited time to figure out where he is and how to get out, but the fact that Lionsgate decided to release this movie on Blu-ray+DVD combo only, with no plans for a DVD only release of the movie (there's also a simultaneous release of the digital download version, just to rub it in to DVD owners). And so, obviously, market share for this title is at 100%, but it managed to become the 7th most popular Blu-ray this week, despite not even making the top 20 combined disc sales list. A very interesting release strategy, that perhaps will become more and more common throughout the rest of this year. The stats for the week ending 23rd January 2010 are as follows (you can see stats and analysis for the week ending 24th January 2010 here - note that data has since been revised, and the reporting period has changed as well, but this historical data is still useful for comparison purposes). Blu-ray sales increased by $3.05m (up 14.81%), while DVD sales decreased by $28.7m (down 21%) producing an overall loss of $25.65 million in combined revenue. Blu-ray's market share increased from 13.09% to 17.96% (a growth of 37.2%). Admin why is market share for Buried at 100% when the combo disc sales count as Blu-ray and not DVD? Also is the combined disc sales list some stat apart from the Blu-ray+DVD combo disc stat list which counts as Blu-ray? Kind of confusing being that it was the 7th most popular Blu-ray for that week. When I say market share, I'm always referring to Blu-ray market share (this is a Blu-ray sales analysis, after all ), and as you mentioned, combos are counted as Blu-ray so *Blu-ray* market share for Buried was naturally at 100% (and it's not shown in the actual Blu-ray market share charts, because it did not have a simultaneous DVD release). As you can see, Buried did not make the top 20. How come Buried is 100% of the market share yet Takers and Justified:Season 1 are 32% and 32.8% respectively? It's all Blu-ray market as you mentioned. So 30% and 32% from 100% leaves 38% for anything else no? If in fact Buried took 100% then I'm missing something here obviously. I think you're confused about what market share means. By Blu-ray market share, I mean the percentage of the movie that was sold on Blu-ray, versus the percentage sold on DVD, for *each* title. Takers at 32% means that out of all Takers discs sold, 32% were on Blu-ray (and so 68% were on DVD). Since Blu-ray+DVD combos are counted as Blu-ray, and there were no DVD versions of Buried, it's Blu-ray market share is 100% (in other words, the Buried DVD version accounted for 0% of all Buried disc sales, since it did not exist). As for why a 7th placed Blu-ray only release did not make the top 20 combined list, it requires a bit of maths to figure it out using the "Top 20 Blu-ray" index figures and the market share data, and it's easier if we convert everything to real numbers first. Buried had a Blu-ray sales index of 26.11, while The Expendables (last place on the combined top 20 list) had a Blu-ray sales index of 14.07. Times both numbers by 100, we get 2611 and 1407 - let's pretend these are the actual number of Blu-ray units sold for each movie. We know that The Expendables' Blu-ray market share was 43%. This means the total units sold figure for The Expendables, including both DVD and Blu-ray units, becomes 3272 (1407 out of 3272 is 43%). Since all of Buried sales were of the combo version and there were no DVD-only versions, the Buried "sales figure" of 2611 *is* the total units sold figure for this movie, and since it's below the total units sold figure of The Expendables (3272), the 20th placed title on the combined list, this is why Buried did not make the combined top 20 list. Bruce Willis' Red was this week's top selling Blu-ray movie, easily outselling the number two title, which was also a new release, Secretariat. And there was still room for a new release in third spot, Saw: The Final Chapter, just above The Social Network. And there was room for two more new releases in the top 10, with Open Season 3 coming in at 5th, and The Girl Who Kicked the Hornet's Nest at 7th. So quite a new new releases, and with the top 3 all being new, this helped Blu-ray sales to rise and market share along with it. Blu-ray market share rose compared to last week, but did not come close to breaking the 20% barrier, despite Red being the 4th highest ranked title by Blu-ray market share this week, at 45.52%. Saw: The Final Chapter also did relatively well at 40.08%, and Secretariat at least managed to rank in the top 20, coming in at 29.68%. The other two new releases fared less well, with 25% and 23% respectively for The Girl Who Kicked the Hornet's Nest and Open Season 3. The stats for the week ending 30th January 2010 are as follows (you can see stats and analysis for the week ending 31st January 2010 here - note that data has since been revised, and the reporting period has changed as well, but this historical data is still useful for comparison purposes). Blu-ray sales increased by $6.31m (up 27.61%), while DVD sales decreased by $32.25m (down 20.9%) producing an overall loss of $25.94 million in combined revenue. Blu-ray's market share increased from 12.9% to 19.28% (a growth of 49.46%). Now I get it. The Top 20 combined chart formula is a bit more complicated. Now I know what they mean when they say numbers can be rearranged to represent anything other than the real facts. Thnx. Bruce Willis' Red just about held on to top spot, with the Blu-ray combo exclusive release of the 60th Anniversary edition of the Disney classic Alice in Wonderland being the second top seller. Beverly Hills Chihuahua 2 managed third place, while the final new release in the top 10 came in at 5th for Let Me In. There were actually two more new releases in the top 20 all discs charts, Conviction in 9th, and Never Let Me Go in 20th, but neither actually made it to the top 20 Blu-ray sales charts due to their low scoring Blu-ray market share (at 10% and 20%, respectively). 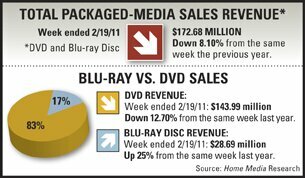 More on market share, and why DVD's had a slight rebound, later. As you can see above, Blu-ray's market share dropped slightly following a small rebound for DVD, and the reasons are pretty clear. The lack of any new hit releases failed to push last week's number one, Red, off top spot, and there were even two titles in top 20 all-discs chart that didn't even make the Blu-ray sales chart, due to low Blu-ray market share for those two titles (Conviction and Never Let Me Go). In fact, the top selling movie when both DVD and Blu-ray sales are combined is actually Beverly Hills Chihuahua 2, which only came third in the Blu-ray sales charts. This is because this direct-to-video release only managed a 16% Blu-ray market share. So even with the Blu-ray exclusive Alice in Wonderland, overall Blu-ray market share dropped. For the other new release, Let Me In, it managed 35.97%. The stats for the week ending 6th February 2010 are as follows (you can see stats and analysis for the week ending 7th February 2010 here - note that data has since been revised, and the reporting period has changed as well, but this historical data is still useful for comparison purposes). Oddly enough, the market share for the week ending Feb 6th 2010 was almost exactly the same as a week ago (week ending 30th Jan 2010). Blu-ray sales increased by $2.72m (up 11.12%), while DVD sales decreased by $34.43m (down 20.8%) producing an overall loss of $31.71 million in combined revenue. Blu-ray's market share increased from 12.88% to 17.17% (a growth of 33.3%). Blu-ray market share dropped to recent lows as DVD sales posted a recovery. The reason for this will be explained later on. Paranormal Activity 2 was the week's top selling Blu-ray title, narrowly beating the last two week's number one title, Red. Life as We Know It was third, while For Colored Girls came in at 4th. There was room for another new release at 9th, for You Again. As mentioned earlier, Blu-ray market share dropped to its lowest level since mid November of last year, and this was due to several factors. In the combined (DVD + Blu-ray) sales list, the top selling titles were actually For Colored Girls and Life as We Know It, at 1st and 2nd respectively. Yet on Blu-ray, both were only 3rd and 4th (in reversed order as well). This is because both titles had a fairly low Blu-ray take-up rate, with For Colored Girls at 12% and Life as We Know It at 15%, far below the 30%+ we expect from new releases these days. The drop in Blu-ray market share also was a result of last week's number two ranked title, and also a Blu-ray exclusive, Disney's Alice in Wonderland, dropping all the way down to 13th. In fact, none of the new releases in the top 10 had a Blu-ray market share number to write home about, as none even made the top 20 market share chart. Paranormal Activity 2, for example, only managed 27%, You Again with 16%. Ironically, the titles outside of the Blu-ray sales top 20 did a little bit better, with My Soul to Take managing 23% Blu-ray market share, and Ong Bak 3 with a much healthier 40.84%. These all combined to give a "poor" overall Blu-ray market share percentage for the week. The stats for the week ending 13th February 2010 are as follows (you can see stats and analysis for the week ending 14th February 2010 here - note that data has since been revised, and the reporting period has changed as well, but this historical data is still useful for comparison purposes). Blu-ray sales increased by $2.18m (up 8.91%), while DVD sales decreased by $43.66m (down 23.1%) producing an overall loss of $41.48 million in combined revenue. Blu-ray's market share increased from 11.47% to 15.5% (a growth of 35.14%). Another quiet week for Blu-ray, although both revenue and market share increased slightly for the HD format. Unstoppable was the week's top seller on Blu-ray, and amazingly, this was the only new release of the week in the top 20, not just for Blu-ray, but for Blu-ray and DVD combined. Talk about a quiet week! And due to this, the top 10 chart below contains fairly familiar, recently released titles, as well as quite a few older releases from last year, such as Iron Man 2 and Toy Story 3. The lack of new releases didn't help Blu-ray market share figures, although it did improve compared to last week thanks to Unstoppable placing 8th in the top 20 market share charts, with 35.72% market share - not quite record breaking, but "good enough". It was a pretty quiet week for Blu-ray sales, with the highest ranked title by market share (Resident Evil: Afterlife) still not actually breaking the 50% mark (47.5%). The stats for the week ending 20th February 2010 are as follows (you can see stats and analysis for the week ending 21st February 2010 here - note that data has since been revised, and the reporting period has changed as well, but this historical data is still useful for comparison purposes). Blu-ray sales increased by $5.74m (up 25%), while DVD sales decreased by $20.95m (down 12.7%) producing an overall loss of $15.21 million in combined revenue. Blu-ray's market share increased from 12.21% to 16.61% (a growth of 36.04%). Blu-ray sales and market share bounced back this week thanks to an A-list new release, Megamind. The comedy Due Date also sold well on the Blu-ray format, and managed to get second place, not too far behind Megamind. These two top titles helped Blu-ray revenue increase slightly compared to last week, although DVD sales were down. And there was room for yet another new release, in third place, All-Star Superman, although it sold less than a quarter the number of discs as the top title, Megamind. Weeds: Season Six rounds up the new release in the top 10, coming in at 7th. As reported earlier, market share increased compared to recent weeks to almost reach the 20% that was common during the first few weeks of 2011. Megamind recorded a 35.78% Blu-ray market share rating, which is solid, but not spectacular. Due Date only just managed to get into the Blu-ray market share top 20, at 20th place, with 33.25%. Both titles probably did perform well considering their genre (animation and comedy, both of which traditionally don't do as well on Blu-ray as more action oriented movies). All-Star Superman was the week's best performing new release, with 52.88% market share, indication more people purchased this direct to TV release on Blu-ray than on DVD. Weeds: Season Six on the other hand was the worst of the new releases (in the Blu-ray top 10), with only 25% market share. The stats for the week ending 27th February 2010 are as follows (you can see stats and analysis for the week ending 28th February 2010 here - note that data has since been revised, and the reporting period has changed as well, but this historical data is still useful for comparison purposes). Blu-ray sales increased by $10.3m (up 50.7%), while DVD sales decreased by $3.34m (down 2.5%) producing a rare overall gain of $6.96 million in combined revenue. Blu-ray's market share increased from 13.19% to 19.02% (a growth of 44.2%). A new record has been broken for Blu-ray, with the week ending 5th March being the best week for Blu-ray in terms of overall market share since the format's inception. And there was really only one reason for the record: Disney's Bambi: Diamond Edition, which managed to outsell last week's number one, Megamind, by more than a 4:1 margin. And as this title is a time limited Blu-ray exclusive (the DVD Diamond edition is not released until a month later in April, as is the case with Disney releases), the "100%" market share propelled Blu-ray to the aforementioned record. But while Bambi stole the limelight, there were still a few more new releases in the Blu-ray top 10 that deserve a mention. Burlesque came in third, just above Faster in fourth, 127 Hours in 6th and Love & Other Drugs in 7th. So with a healthy list of new releases, and a Blu-ray exlusive number one, Blu-ray revenue also increased, not a record of course, but still well above recent weeks. The record market share, not seen since Avatar's release in April of last year (barring any changes to the Avatar week figures, which HMM will probably re-adjust once again), was all due to Bambi's 100% market share (as it was a Blu-ray exclusive ... Blu-ray+DVD combos are only counted as Blu-ray releases). Most of the other new releases did averagely, with 127 Hours being the best performer at 32.97%, with Faster closely behind at 32.41%. Burlesque was further back at 26.66%, while Love & Other Drugs did relatively poorly at only 18.67%, way down at 20th in the market share list. Inception was top of the same list, with 55.05% market share, meaning that the Blu-ray version of this hit movie outsold the DVD version once again. The stats for the week ending 6th March 2010 are as follows (you can see stats and analysis for the week ending 7th March 2010 here - note that data has since been revised, and the reporting period has changed as well, but this historical data is still useful for comparison purposes). Blu-ray sales increased by $10.59m (up 34.08%), while DVD sales decreased by $24.2m (down 15.4%) producing an overall loss of $13.61 million in combined revenue. Blu-ray's market share increased from 16.51% to 23.86% (a growth of 44.52%). Blu-ray market share remained above 20%, just shy of 21%, although it was down compared to last week's record results. Bambi: Diamond Edition remained the week's top selling title, and again this Blu-ray exclusive release is helping market share numbers to stay up, although by no means it was alone in helping (more on that later). The best selling title of the week, on all formats, was actually Jackass 3, although it only managed 2nd place in the Blu-ray charts (but came close to ousting Bambi). The Walking Dead: The Complete First Season was in third place, while fourth place was also a new release: The Next Three Days. That was it for new releases in the top 10, although Morning Glory was in 12th place, having actually been 8th in the Blu-ray and DVD combined charts. While Bambi's "100%" market share helped overall Blu-ray market share to remain high (especially helpful as Bambi was the top selling Blu-ray title once again), the other new releases also helped to keep market share above 20%. Jackass 3 had a 39.91% market share, an excellent result for movies of this genre, while The Walking Dead: Season 1 was more closely aligned with the Blu-ray demographic, it also did extremely well with 45.39% market share, probably one of the best results for a TV series yet. The Next Three Days also did relatively well, at 35.66%. Only Morning Glory did poorly, with only 15% market share, which explains why it failed to make the Blu-ray top 10 despite comfortably coming in at 8th on the combined charts. The stats for the week ending 13th March 2010 are as follows (you can see stats and analysis for the week ending 14th March 2010 here - note that data has since been revised, and the reporting period has changed as well, but this historical data is still useful for comparison purposes). Blu-ray sales increased by $4.37m (up 16.5%), while DVD sales decreased by $51.68m (down 30.80%) producing an overall loss of $47.31 million in combined revenue. Blu-ray's market share increased from 13.63% to 20.99% (a growth of 54%). The Fighter was the week's best selling title on Blu-ray (and on DVD as well). Last week's number one and the main catalyst behind the recent Blu-ray market share records, Bambi, fell to second place. In third place was another new release, Hereafter, and the other new release for the week was The Switch, in 7th. So with a less stellar list of new releases, and Bambi sales falling, Blu-ray revenue and market share both fell compared to the previous week. As explained earlier, market share fell slightly due to the Blu-ray exclusive Bambi selling fewer copies (it had been the best selling title two weeks in a row, but only sold just a bit over a quarter as many copies as The Fighter). But the week's top seller, the new release The Fighter, did well enough to limit the fall - The Fighter managed to get a 39.63% market share figure. Hereafter did less well, at 31.22%, while The Switch did not even make the top 20 market share charts, with only 17% market share. In fact, the number two best selling DVD of the week was actually Barbie: A Fairy Street, which wasn't even available on Blu-ray, and this is probably as responsible for the drop in market share as the fall in Bambi sales. The stats for the week ending 20th March 2010 are as follows (you can see stats and analysis for the week ending 21st March 2010 here - note that data has since been revised, and the reporting period has changed as well, but this historical data is still useful for comparison purposes). Both DVD and Blu-ray sales decreased compared to the same week last year. Blu-ray sales decreased by $9.72m (down 27.1%), while DVD sales decreased by $110.79m (down 49.6%) producing an overall loss of $120.51 million in combined revenue. The large decrease can be attributed to the release of the then latest Twilight movie, which did very well on DVD (as compared to Blu-ray, hence the smaller Blu-ray drop). Blu-ray's market share increased from 13.83% to 18.84% (a growth of 36.23%).